THE TALISMEN are back in style! A terrific recent CD release is a collection by Cheltenham beat group The Talismen who topped the first Midland Beat readers poll back in 1964. This disc is full of the group's original 1960s recordings including the highly sought-after 'Masters Of War/Casting My Spell' single that has Led Zeppelin's Jimmy Page as session guitarist. 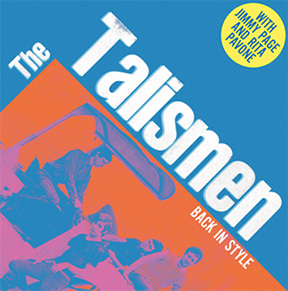 Original recordings by The Talismen have been difficult to find in the UK. The group had more records released in Italy where they became big stars during the 1960s and as the backing group for teenage Italian singer Rita Pavone. This limited edition CD released by the Talismen Fan Club contains 20 tracks, three of which feature Rita Pavone. Also included are some never-before released recordings by the group from recently discovered tapes. It's all attractively packaged too within a jewel case containing a fold-out with liner notes by Chris Stanbury. The previously mentioned 'Masters Of War' is an early cover of the famous Bob Dylan anti-war song, now just as relevant today as it was back in 1964. The standout track for me is 'Casting My Spell', a wonderful high-energy beat-style recording with a great vocal and prominent lead guitar from Jimmy Page. These two rare Shel Talmy produced/Glyn Johns engineered tracks alone are worth the price of the CD in my opinion. An interesting alternate version of Casting My Spell also appears later on the CD. Some standards of the day are also covered in this collection such as 'Doctor Feelgood', 'Monkey Time' and 'Spanish Harlem', on which The Talismen provide a great performance. There are some surprises too like an arrangement of the Spencer Davis Group's 'Strong Love', plus a version of The Who classic 'Can't Explain' which they maybe should not have attempted. 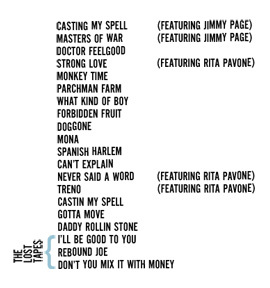 Some of the tracks with Rita Pavone such as 'Treno' feature a lead vocal sung in Italian. Surprisingly, the audio quality of almost all the Talismen recordings on this CD is very good although it's obvious that some of the sources used were better than others. One thing you will be aware of when hearing these records is the very high-energy that was captured to give most of the tracks a refreshing almost 'live' feel. Performances by the group back in those days must surely have got the audience up on the dance floor as it's difficult even more than 40 years later to keep from tapping your feet! Fans and collectors of 1960s British groups of that era will not be disappointed with this CD. On a sad note, The Talismen's drummer Trevor Cook passed away recently following a battle with lung cancer. The group had enjoyed a revival of sorts during the last few years with a successful re-union of the original band members and gaining an increasing number of bookings for their live shows. The tremendous drumming performances on the tracks of this CD stands as a tribute to Trevor who will be greatly missed and whose loss will leave the future of The Talismen in some doubt.